Leading independent traffic measurement tools (Alexa.com, Compete.com and TrafficEstimate.com) support the fact that MySummerCamps.com and KidsCamps.com are the most visited camp related websites on the Internet, outperforming every other online camp directory in a head-to-head comparison throughout the year. Click here to see a detailed comparison of the top online resources for the camping industry. Alexa.com offers a compelling reflection of this exceptional performance. Alexa.com provides a measure of a site's popularity by combining their average daily visitors and page views over the past 3 months and ranking it against other sites on the Internet. Much like the New York Times Bestsellers list, the closer the ranking is to #1, the more popular the Web site. MySummerCamps.com and KidsCamps.com rank significantly higher than their competitors, proving their status as the leaders in the camp marketing industry. Help More Parents Find Your Camp with SEO! Search engine optimization (SEO) is the practice of strategically modifying the content on your Web site so that search engines can find and present your site to its users. For example, if you operate a basketball camp in New York, using SEO techniques will help parents who do a general search on Google for "basketball summer camps in New York" to find your specific camp among the top search results. Determine what keywords or key phrases parents will use to find camps like yours. Think of all the ways someone would describe your camp without referencing the name directly. Your list of keywords will likely include the type of camp you operate (horseback riding, robotics, ice hockey etc. ), your audience (boys, teenagers, dancers, etc. ), and regional descriptors (Nashville, Twin Cities, Cohocton Valley, etc.). Include at least 3-5 of your top keywords or key phrases on each page of your camp Web site. Focus on headlines and the first few sentences of any descriptions. Don't rely on images or graphics alone to tell parents they're looking at a sailing camp in Maryland. Make sure the key phrases "sailing camp" and "Maryland" can be found among the text at the top of your home page. Use your keywords and camp name in the anchor text of your site links. Search engines like finding relevant links on your site that they can share with their users. For example, a link that says "Click here to register for the 2011 Crawford Teen Ballet Camp " is better than a link that only says "Click here to register." Make sure your page titles are descriptive and include your camp name. Page titles are the words that display at the very top of the Web browser window. Rather than giving a simple description like "Directions," adding your camp name and expanding the title to "Driving Directions to Stanford Kids Day Camp" will help search engines find you. Submit your URL to Google, Yahoo! and Bing. Registering your camp Web site with each search engine tells them your site exists and should be included in search results. You should also register with the local sections of Google, Yahoo! and Bing so your camp shows up on local maps and directories. Don't overdo it! Search engines are getting smarter and smarter, so they'll recognize tricks like overloading your site with keywords or using keywords that aren't relevant to your content. Stick with the basics, evaluate your keyword usage from time to time, and focus on contextualizing & describing your content for viewers. MySummerCamps and KidsCamps traveled to San Diego last month for the 2011 ACA National Conference, joining hundreds of camp professionals in celebrating 150 years of camp! We enjoyed meeting existing clients and introducing new camp directors to our comprehensive directory sites. 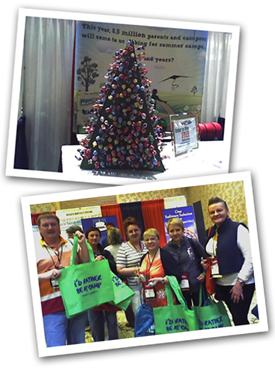 Our lollipop tree was a huge hit with attendees. We also distributed hundreds of our signature green tote bags featuring the slogan "I'd Rather Be at Camp!" When a group of camp directors from Russia approached with their interpreter asking about the bags, we asked if we could take their photo for our newsletter. They agreed happily. Congratulations to our free listing giveaway winner Tim Horton's Children's Foundation. Next stop - the ACA Tri-State Conference in Atlantic City! Be sure to stop by booth #148 and say hello to our friendly staff and enter to win a free listing for your camp! Camp enrollment season has begun and your recruitment efforts are in full swing. Your listings on MySummerCamps and KidsCamps are updated and ready to go. Your brochures are in the mail and you are getting ready to meet new people at an upcoming camp fair. Bring on the campers! "It's too expensive." - Showcase any early bird or sibling discounts you have. Consider offering a multiple session package or a payment plan to help ease the financial burden. Also, mention grant programs or other sources of funding your campers have used in the past. "Summer is already too busy." - Remind them that camp is a one-stop shop for summer fun! Highlight how your program offers recreational activities and educational opportunities at the same time. If they're concerned about the length, point out any weekend camps or shorter sessions on your schedule. "We don't know our schedule yet." - Explain why it's better for parents to sign-up and reserve their spot now rather than wait until it's too late. Outline your refund/cancellation policy and any rescheduling guidelines you may have. "I want to keep exploring my options." - Get their contact information and follow up with them later. Call or email at least twice before enrollment closes to remind them of your offerings and discounts. The more you anticipate what parents will say, the better prepared you'll be to address their concerns and turn the conversation in your favor. Be kind but persistent and the enrollments will start coming in!